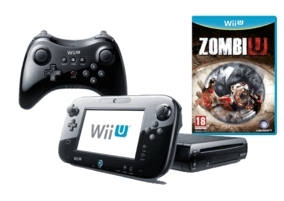 In addition to the Wii U Basic and Premium Packs, Nintendo announced a bundle which includes the Wii U Premium Pack with the highly rated ZombieU game and additional Pro Controller. Amazon and Tesco Entertainment are currently taking pre-orders and charging £329.00 with Free delivery. When compared to the standard Premium Pack (£299.99) this equates to an extra £30 which in our opinion is really good value for money considering that ZombiU separately is likely to cost at least £40 and the additional controller probably around the £30 mark, meaning a probable saving of around £40. ZombieU is a first person shooter game in which the player controls a survivor of the "fog of death" in London to survive endless waves of zombies. The game makes full use of the new revolutionary GamePad tablet controller as you try to keep an eye of both the GamePad and TV screens to survive. This game is horror based and comes with a 18+ age rating.